I finally have some knitting content to show. Below is a sweater I made for my cousin’s baby girl, Reilley. 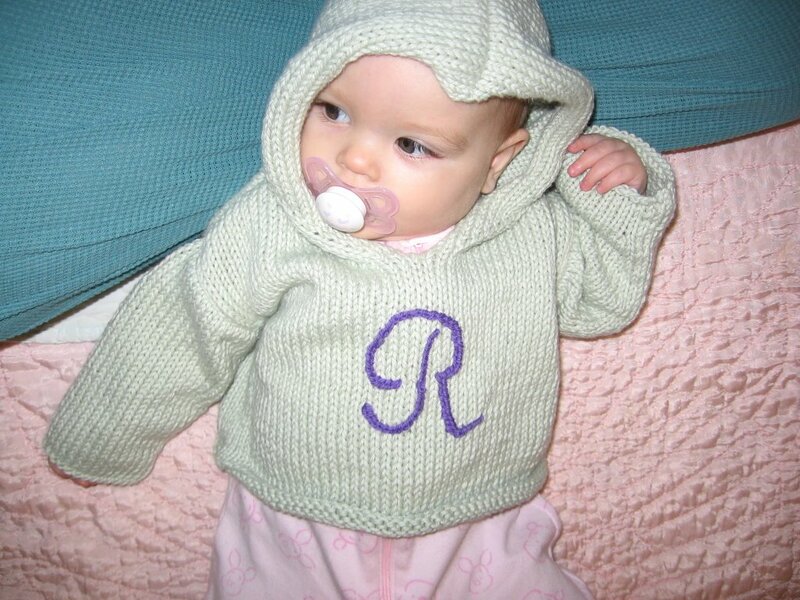 It’s the Hooded Sweater from Debbie Bliss Special Knits, knit with Knit Picks Main Line in silver sage. I absolutely LOVE this yarn. It’s 75% pima cotton and 25% merino and it feels very similar to Debbie Bliss’s cashmerino aran. It’s that soft. My cousin picked out the color before she knew she was having a girl, so I embroidered a purple R on the front to make it look a little more girlie. Click on the button to go to the project’s website and read all about it. 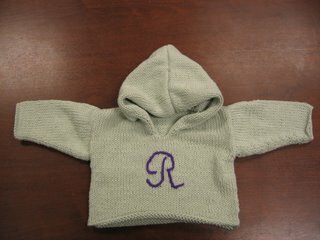 If you are a knitter, please think about signing up. Schaefer Anne sock yarn! This stuff feels so great that I just want to sit and pet it. Also, because she wants to bring me over to the dark side make me a more rounded fiber artist, some roving that needs to be spun. 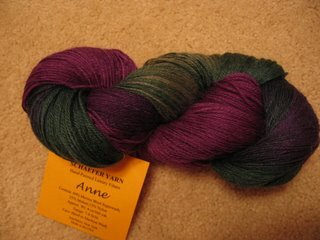 The colors in both the yarn and the roving are very much me. Sorry, I’ve already forgotten what kind of wool it is. I told hubby that now I will have to get a wheel. He has no idea what I mean by this or how much it would cost, but they aren’t cheap. 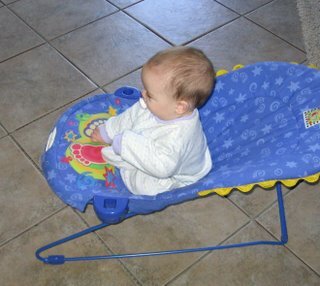 Perhaps I should borrow one first and then see if I this is a skill I am even capable of learning. 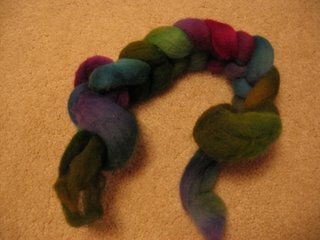 I have tried spinning with a drop spindle before and it wasn’t great. I know better than to expect perfect results just starting out, but I really wasn’t happy with the rudimentary looking yarn I produced. Plus it took for-freaking-EVER just to spin a few yards. I’m thinking a wheel would definitely be the way to go. You know, because I need more hobbies to fill the void in my life. 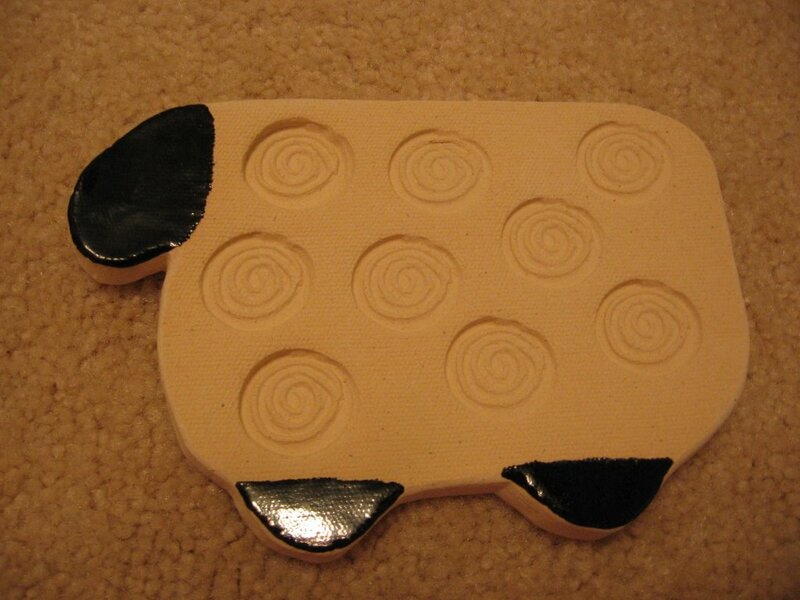 Lastly, a very cute sheep soap dish. Thanks, KatyaR! You are a wonderful friend and as usual, you rock. Isn’t this cute? KatyaR says she wants to make this into a t-shirt. Again, I know this is late, but bear with me here – the only blogging time I have lately is at work. 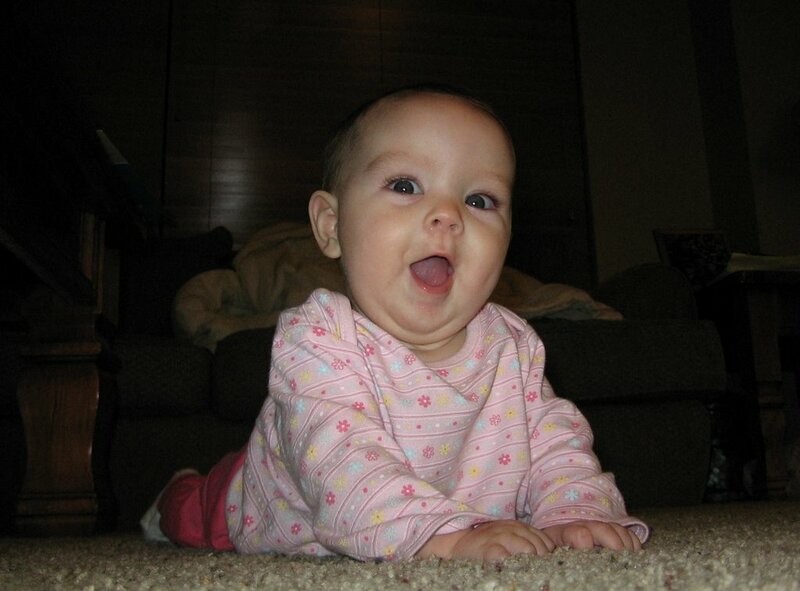 So, the election was freakin’ awesome! I’m disappointed in some of the people who live in my district who voted a former legislator, right wing nutjob extraordinaire into district judgeship, and the Rep that I wanted to win so badly lost by only 128 votes, but hey, at least people got out and voted. But big news for Washington, eh? That more than made up for any nausea or disappointment I felt for my district. I have renewed hope for this country. I know it’s a little late, but I have a couple of updates for you. 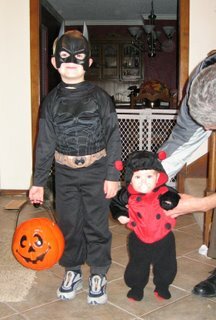 Halloween went exceedingly well and our little Batman brought home an obscene amount of candy. The real hit was the baby though. 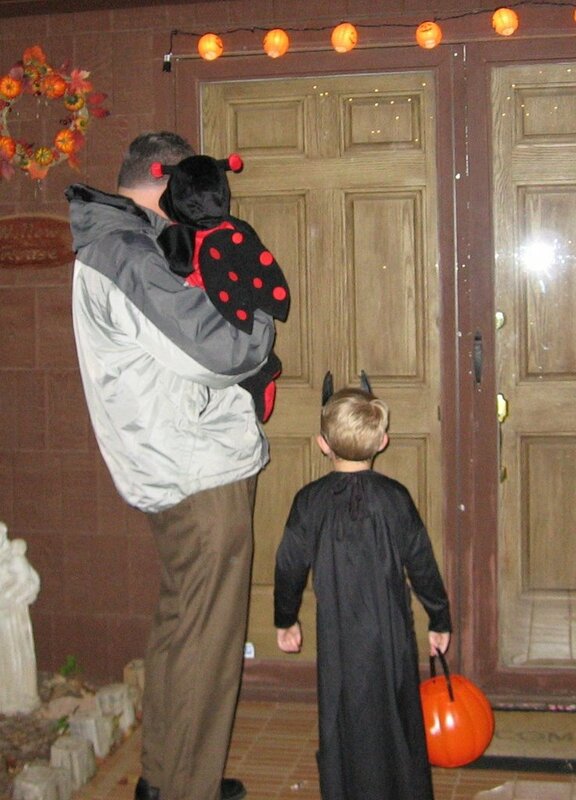 We dressed her up in a little ladybug costume and took her with us when the boy went trick-or-treating. People would make comments about how cute she was and offer us candy for her (we said no). 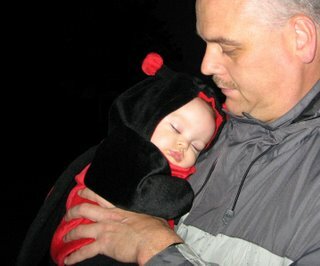 On our way around the block, she fell asleep in her daddy’s arms and one lady commented that she looked like one of the Anne Geddes calendar babies. I agreed with her. 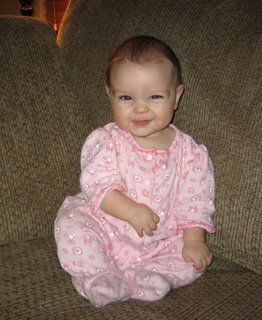 And that brings me to the other update: Kelsey turned 6 months old a few days before Halloween. 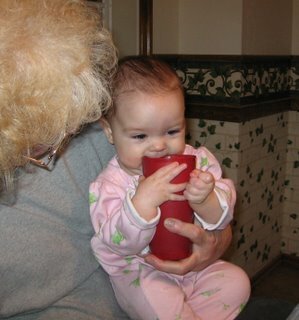 She is almost ready to sit without support and she has started eating some baby foods. 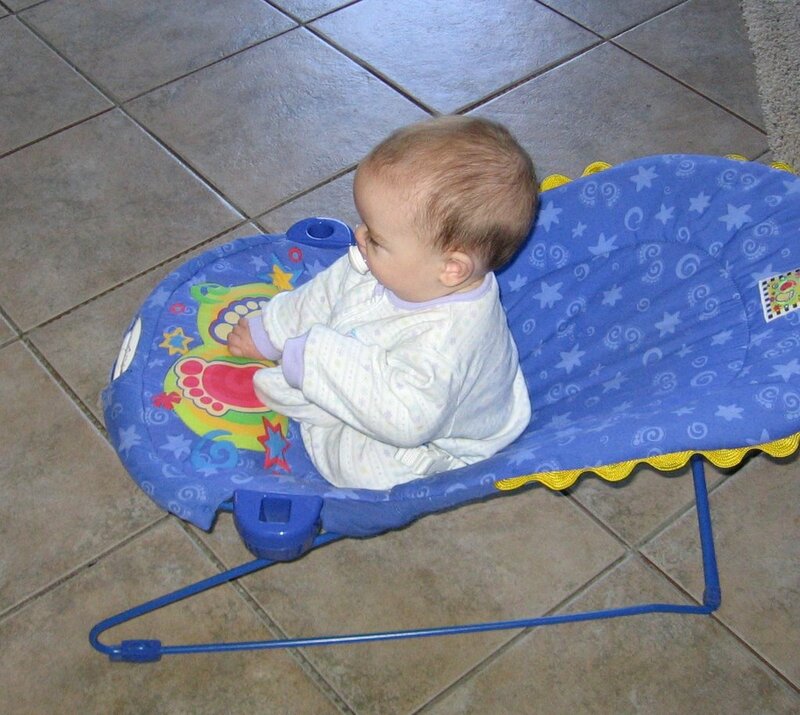 In this picture she is sitting in her bouncy seat, which is one of her favorite things to do. She loves to laugh at her brother and she’s very ticklish. She also likes to grab your cup and gum it to death, like she's doing here with her Grammy. She’s also starting to go through the beginning phases of separation anxiety where she cries if I leave the room, even if her daddy is holding her. She also cries if set her down so I can go to the bathroom, and heaven forbid, if I turn my back on her so I can cook dinner. It’s very frustrating and hard to get anything done because I have to think up new ways to entertain her while I go about doing what I need to do every day. Braden helps to a certain extent, but she seems to be pretty attached to mama so there are times when only mama will do. But that’s all a normal part of development and this too shall pass. 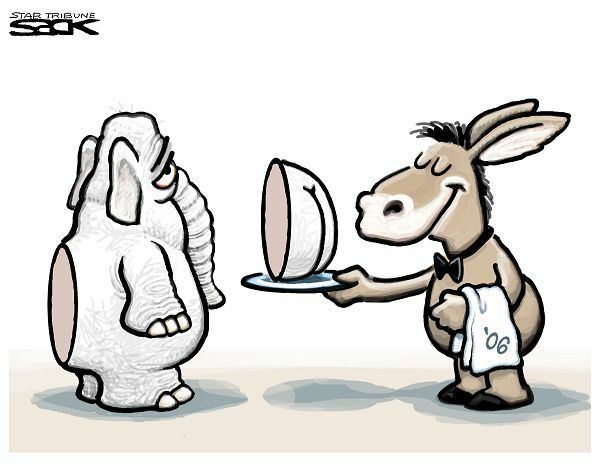 PS: DON'T FORGET TO VOTE TODAY!